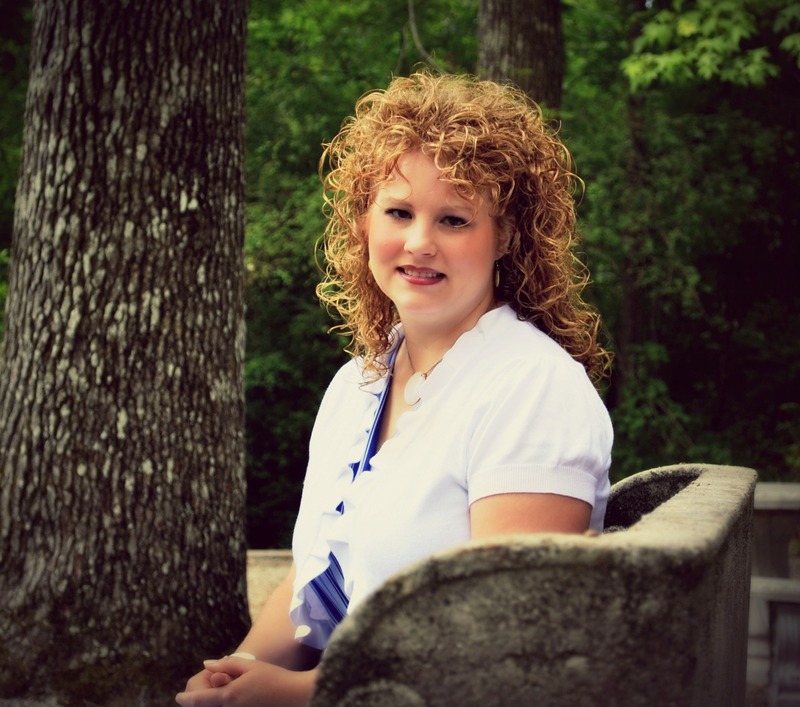 Thanks to Behr paint for sponsoring this post. I have used and loved Behr products in my home for years so all opinions expressed are all mine. 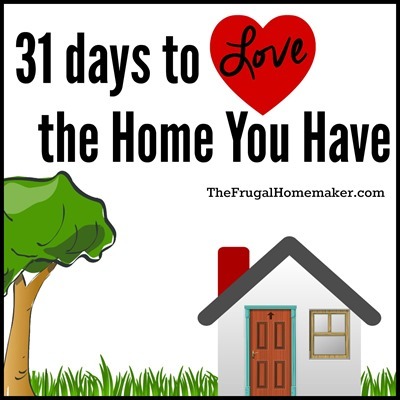 Paint is one of the quickest, easiest and most effective way to make changes in your home. Whether it be on your walls or on furniture, paint can make a world of difference! 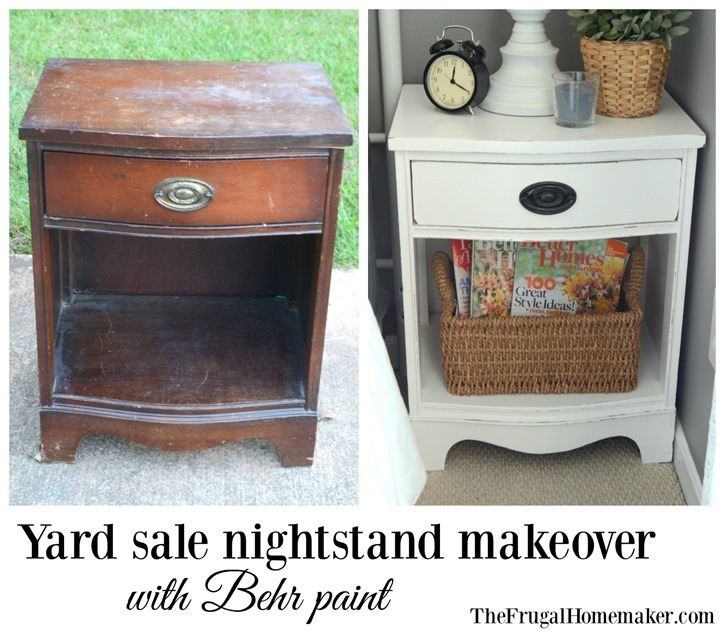 When I bought that set of furniture for $40 at a yard sale for my master bedroom makeover this nightstand was one of the pieces that was included. I have already refinished the tall chest and shared how to repair veneer here, and then I refinished the long dresser and mirror. Since the top of both of those was in good condition, I stripped and stained it and then painted the bottom portion. 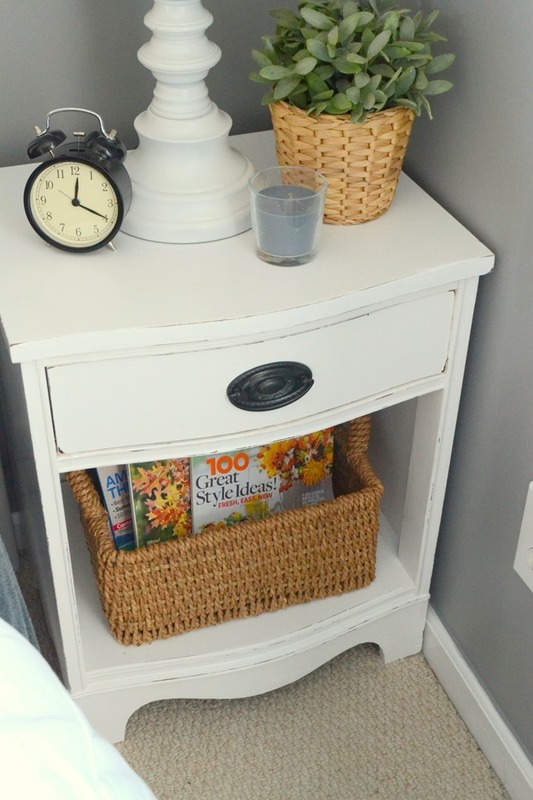 The nightstand was too small and too short to use in my master bedroom but was a perfect fit for a small space I had in my guest room for a nightstand. But first it needed a bit of help. There was a small portion near the bottom leg on the side that I had to fill and sand to repair the veneer (you can see how to do that in this post). But otherwise, I just gave it a light sanding to smooth out as many scratches and nicks as possible. Since this has a mahogany finish on it, I had to use a stain blocker like I learned with the first dresser to prevent the mahogany stain from bleeding through the white paint. Then the process was easy – just 2 coats of Behr Premium Plus Paint + Primer in One in Ultra Pure White in semi-gloss applied with a small roller. I gave the hardware a light coat of oil rubbed bronze spray paint and then lightly distressed the edges of the nightstand with sandpaper. I have very little space on this side of the bed in my guest room but wanted to have something in there to hold a lamp, clock, and for people to put their phone/glasses at night. 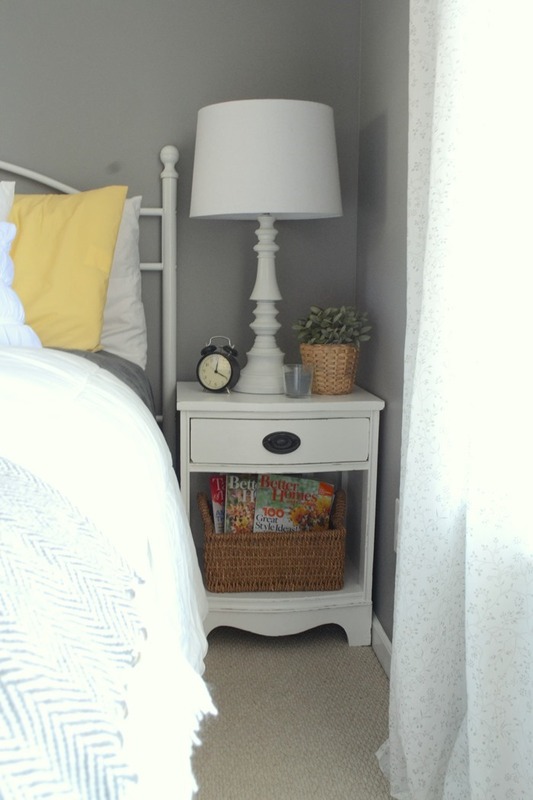 This nightstand is PERFECT for this space. And with its fresh coat of white paint, it looks like it belongs too! I LOVE the open cubby at the bottom. 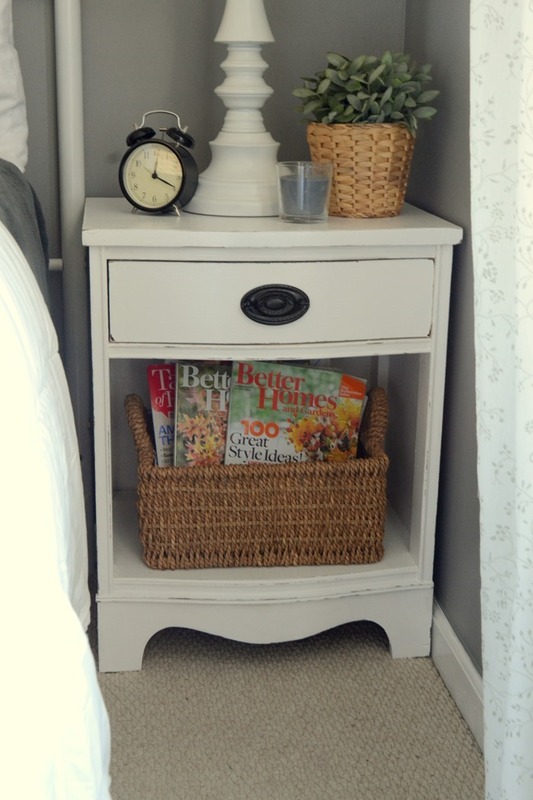 Perfect for a basket to hold magazines or snacks or whatever I wish for my guests. 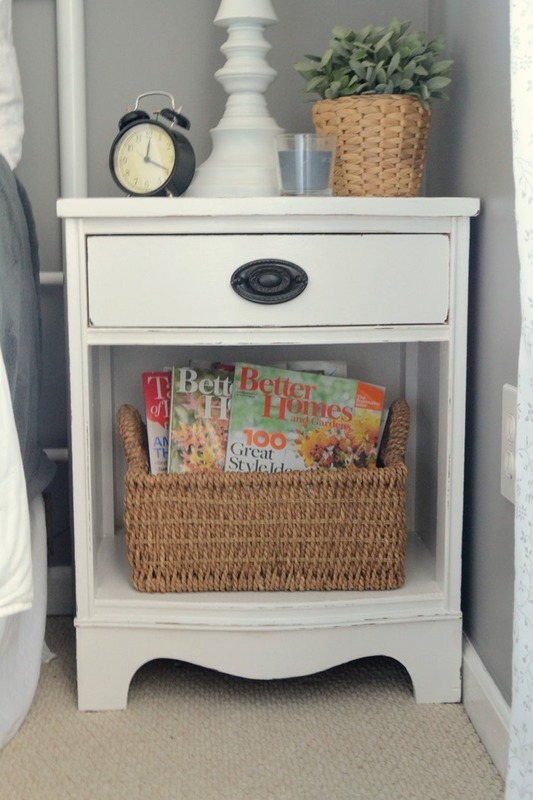 Since white painted furniture can tend to get a bit of nicks and scratches over time, distressing it lightly from the beginning helps hide some of that. Plus I just like how distressing brings out some of the character and lines of the piece. You can distress as much or as little or not distress at all – completely up to you! Before this cubby space sort of got lost. 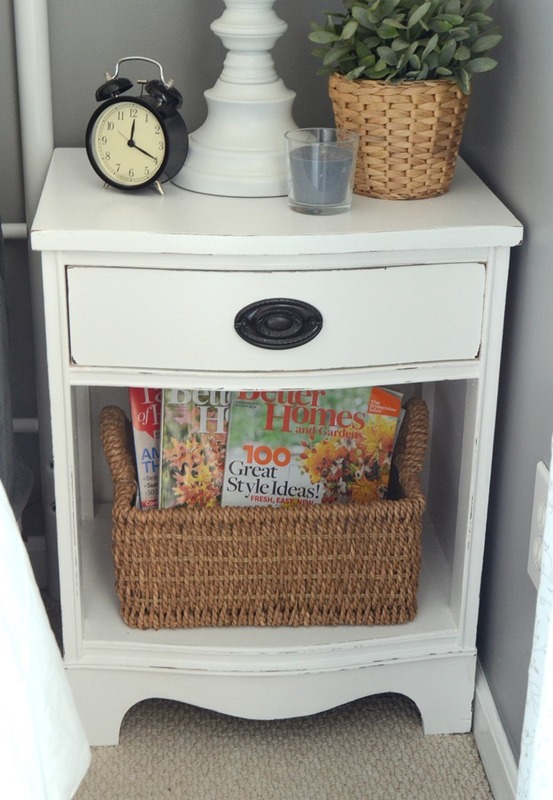 Now that it is bright white – it looks a lot bigger and the basket really pops with color and texture. It goes perfect in this room! I can’t wait to show you the rest of this room. 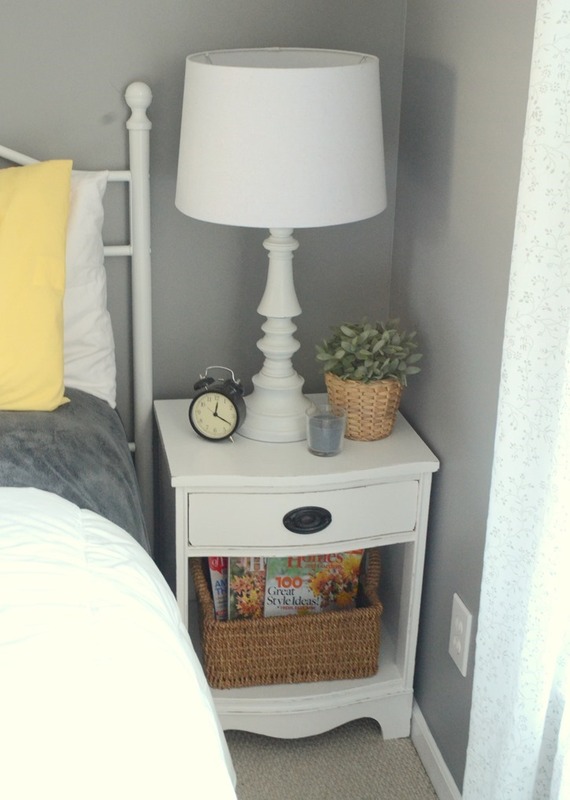 I have showed you the $20 yard sale metal nightstand, the yard sale mirror that got a second makeover, and the $1 wicker stool and $2 metal decor piece that all got paint makeovers for this room. I have a long dresser (actually my childhood dresser) that still needs a makeover and then a tall armoire that needs to be repainted too. Then I can share complete before/after pictures. I love the new Behr color on the walls too (Gateway Gray by Behr Marquee). 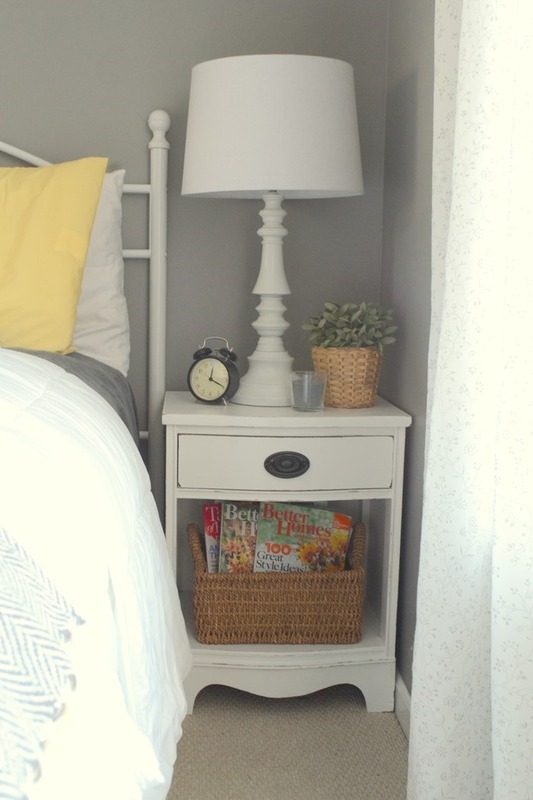 So grab a can of paint and makeover something in your home! It can be something as small as a nightstand or piece of furniture or an entire room. But it can make a huge difference. 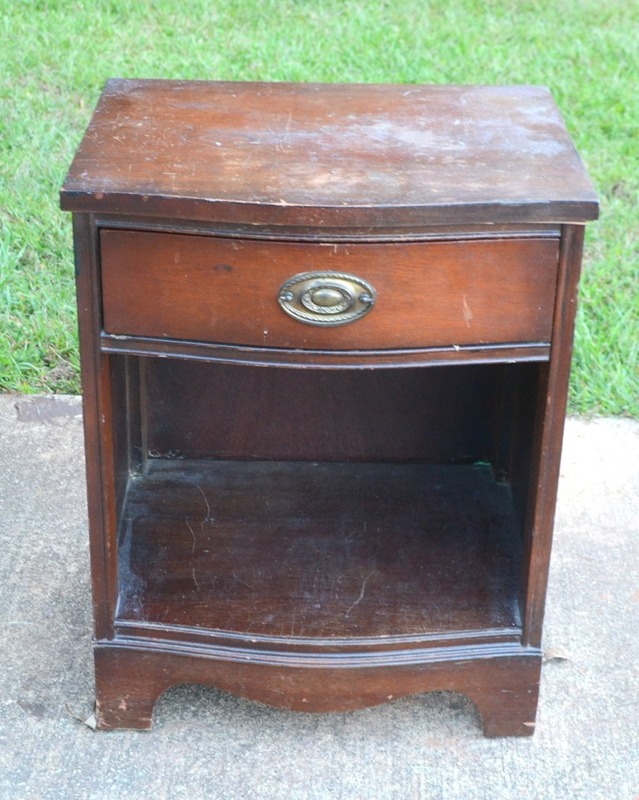 It is now a lovely nightstand! Cute! I need to find something like this for our main guest bedroom. It’s the perfect size to stick beside the bed. Love the makeover! Love it! Christina, this is the reason why I always visits your site. Another superb refurbished art.